Our Lady, Mother of the Church has a system, called My Own Church, for updating your family information! All you need to do is visit https://chicago.parishsoftfamilysuite.com, hit the ‘New User?’, and create an account. Then, someone in the church office will approve your account, and you’ll be able to update all of your family information, including names, addresses, phone numbers, email addresses. You’ll be able to view the Our Lady, Mother of the Church pictorial directory. You’ll be able upload your favorite family photo and chose whether you want that photo (or other information) to be visible to other members who’ve logged in — or you can keep some information private and available only to church administrators. 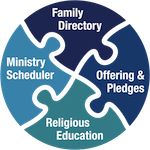 If you’re involved in ministries here at Our Lady, Mother of the Church, the information you put into My Own Church will help us schedule your ministry. You’ll be able to update your preferences and availability and see a calendar of when you’re scheduled for what. Please remember to check out My Own Church soon! With your updated information, we’ll be able contact you when we need to so you don’t miss anything important, and you’ll be able to view your own ministry schedule and giving history. • Accurate records! Whether we’re preparing sacramental certificates or getting in touch by phone, mail, or email, having up-to-date information, with properly spelled names for all your family members, helps us serve you better. • Fewer forms! My Own Church integrates with the other systems we use, so you’ll only have to update your information in one place. • Ministry preferences and schedule! If you serve in ministries, or would like to do so, you can let us know when and where you want to serve, and we’ll schedule you accordingly. • Giving history! View your family giving history anytime you like—no need to ask for a statement. It’s all right at your finger tips, but behind a secure login. • Online registration! When it’s time to register for religious ed. classes, you’ll be able to fill out and submit the form online. • Online pictorial directory! Get in touch with other church families, and let them get in touch with you. Privacy settings are available, too. With your updated information, we’ll be able contact you when we need to so you don’t miss anything important. Get your account today on ParishSoft! If you have questions, please call the church office at 773-625-3369.